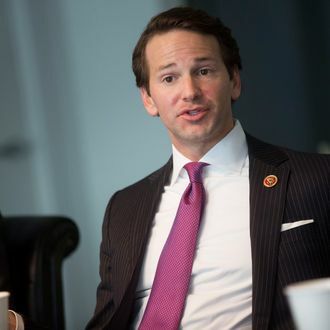 If you picked up the print edition of the New York Times this morning and read the story about an anti-gay congressman widely assumed, based on hearsay and circumstantial evidence, to be gay, you could have no idea it was about Illinois Representative Aaron Schock. One could argue that the story is not about Schock exactly, but about the ethical dilemma of outing a public figure and the media’s responsibility to do so if that person is a huge hypocrite. The Times, by opting only to allude to the man in question, did not pick a side. But if you were to read the same story on the Times website, the blind item could be solved by clicking a single link.